Yuba is like a curd skin made from soymilk. This is a traditional local product of Nikko. 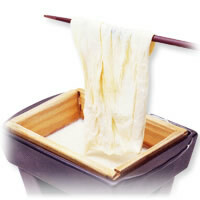 Yuba was popular among the monks in early times in Nikko because it contains rich and enough protein for hard practices. Although, yuba dish is always available, you will be able to enjoy extra dishes if you reserve in advance. Reservation will be available even on the same day as you will visit. Please send an e-mail through the contact form including your name,date, number of people, telephone number(with national code), fax, and e-mail address.